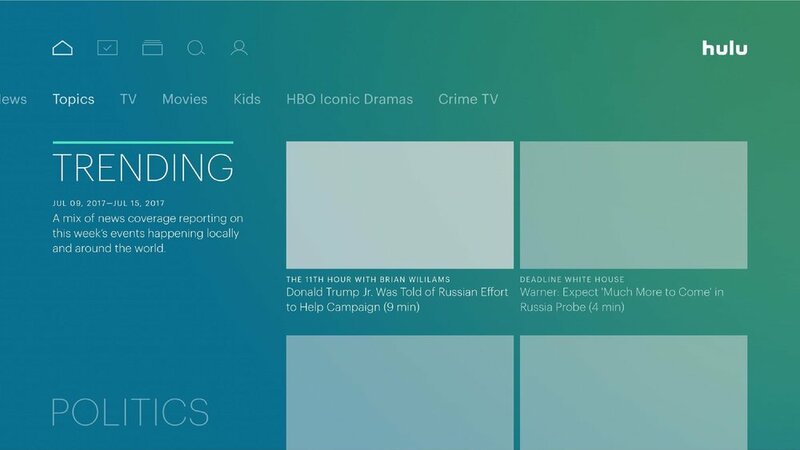 Our goal was to design a Living Room experience that shows relevant and trending news clips to Hulu users in an efficient manner. 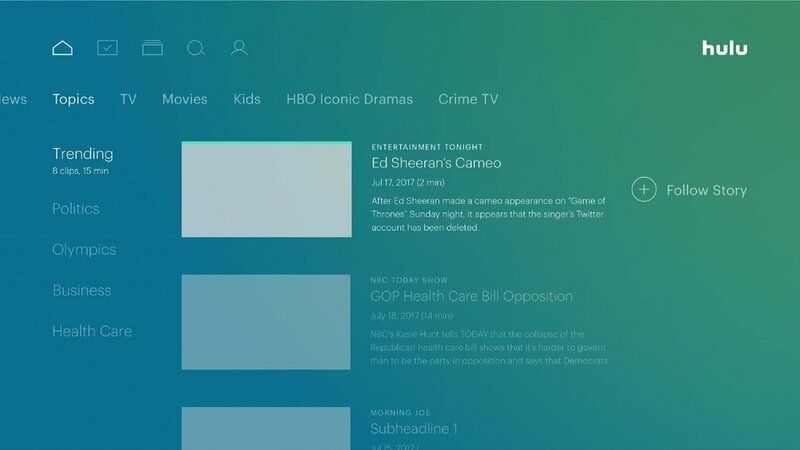 During my UX Design internship at Hulu, I worked with a group of interns to research and conceptualize what the short-forms news experience would be like on the Living Room platform for devices like XBOX and Apple TV. We first did research around news consumption before testing out competitive app experiences to see how others surface short-form news content. After making initial design explorations, we conducted user research studies to iterate on our ideas. 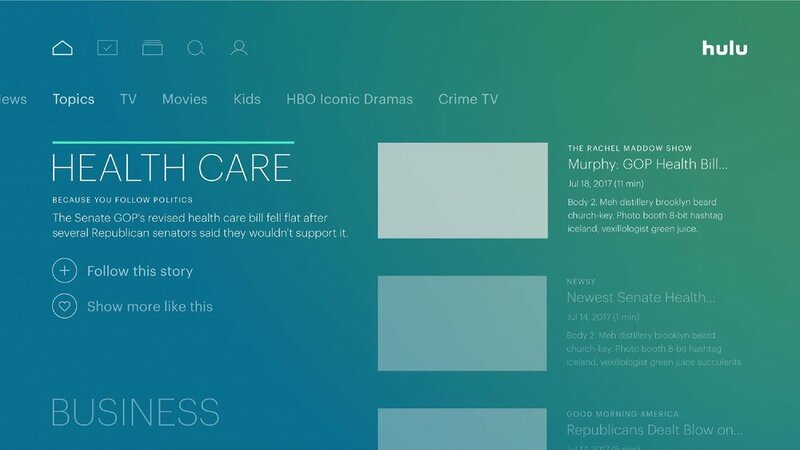 We presented our final deliverable as a high fidelity prototype, made using Principle, to a group of product managers and designers working on Hulu's news experience. News consumption behavior has changed incredibly in the past decade. Nowadays, many people prefer getting their news from online sources over newspapers and TV broadcasts. There is a higher demand for short news clips over more traditional mediums like print. Many people do not have the patience or free time to sit around and watch a hour long cable news broadcast on current events. They want bite-sized and shareable content. People like news clips because they can feel caught up in a short amount of time. In looking through user data, we found that "News" is the most watched short-form category on Hulu. 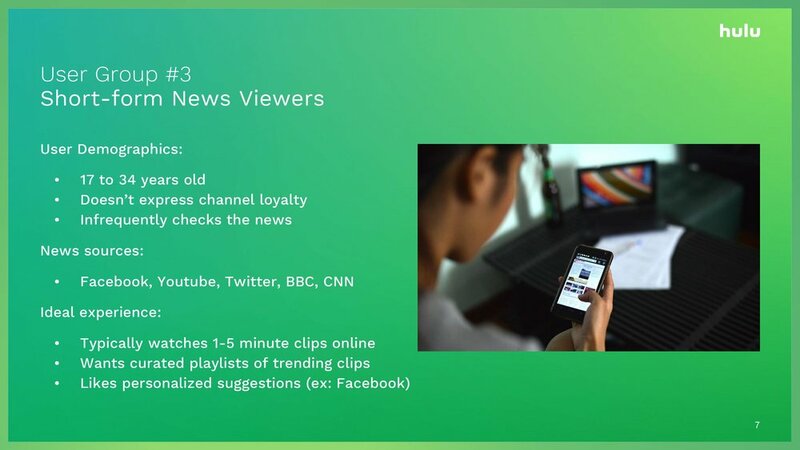 "News" is also the most watched content on Hulu's Live TV service. Users tend to watch live news broadcasts from their living room devices (Apple TV, Roku, Playstation, Smart TV, etc). The second preferred platform for watching the news is on mobile. Currently, users have no way of accessing news clips through the Living Room app. This is unfortunate as Hulu offers a ton of short-form news content to users on their website, as pictured below. When thinking about short-form news, we have to consider where the person is and how they are watching. In an ideal scenario, the experience would be affected by the type of device that the person is using to access the news (mobile, web or living room) and the time of day. We brainstormed a couple of different ways we could approach the project. What would a "Trending News" clip collection look like on the Living Room platform? Do people want a way to personalize their news experience? Would users want to find their own clips to watch or be served playlists of content? 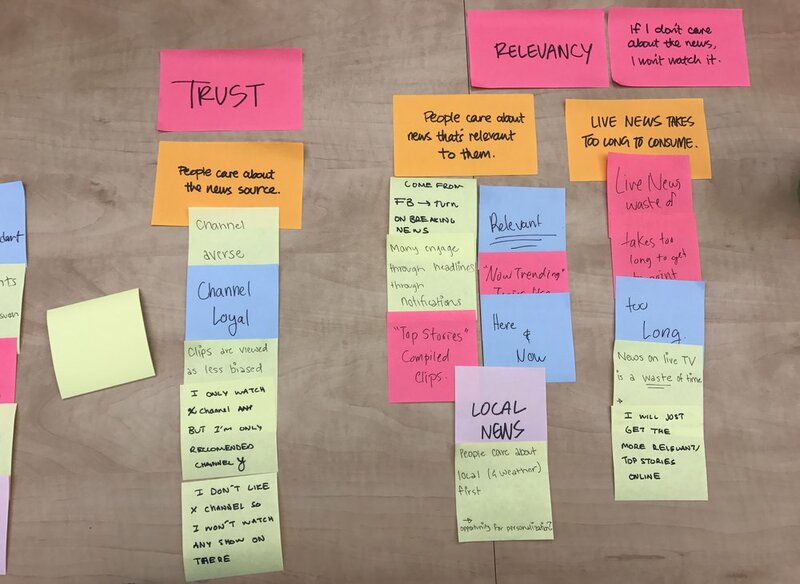 How do we design a news experience that speaks to very different sets of users? We read a handful of online articles, publications and studies to better understand changing news habits. We learned that people catch up on the news when it's most convenient for them. The activity is becoming largely time independent. Most people don't sit around and wait for a televised news broadcast anymore. When an event happens, they'll find a way to learn about it through a number of different channels. Older audiences are apprehensive about getting the news from social media platforms like Facebook and Twitter, however. Young people are notified about current events through multiple sources and devices. Focusing on video news has become advantageous for its perceived credibility. People are very skeptical about what they read on paper and online today. Therefore, they are more trusting of news clips and video footage. People want more choice and variation in the sourcing of their news as a result of this. It's important to note that people are very channel loyal in getting their news updates. They gravitate to the sources that they trust. Lastly, we learned that most people care about the "here and now" when getting caught up on the news. People care the most about the local news, weather and breaking news updates. 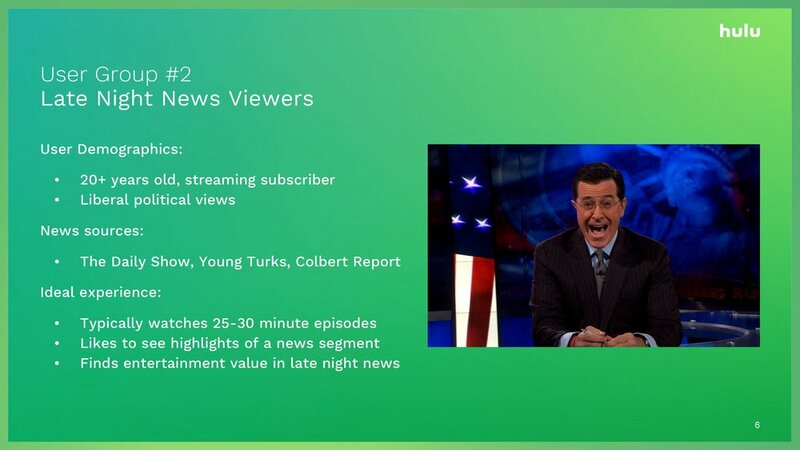 Late night talk shows are notably popular amount our Hulu subscribers. 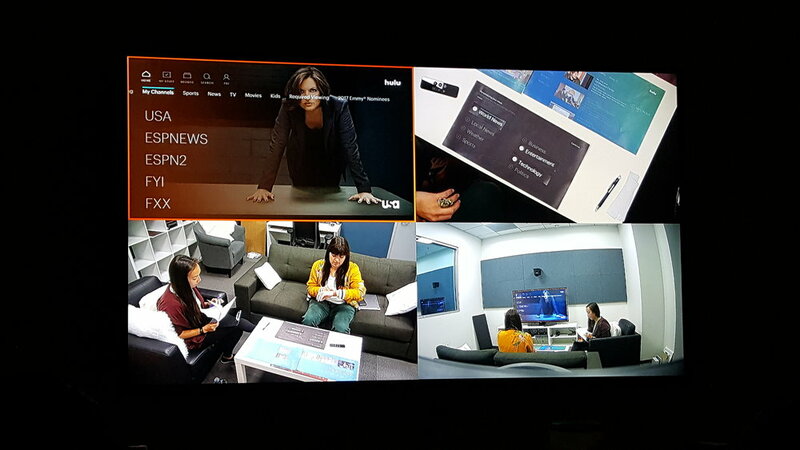 In assisting with the research, I spent time testing popular news experiences on XBOX and Apple TV. I also looked into how certain news websites and mobile apps display short-form news content (ex: YoutubeTV, New York Times). I found a number of patterns across these experiences. The clips were generally not grouped by topic. Almost every app that I tried followed similar naming conventions (Top Stories, Latest News and Live content). The preview for the clips only ever contained a thumbnail image and headline. Details about the clip were almost never shown upfront. The headlines were enough to pull people in. The best experiences were the ones that compiled short playlists for the user to start watching. This allows for a lean back experience where the user doesn't have to interact much with the system. We made an affinity diagram to help us make sense of our research findings. 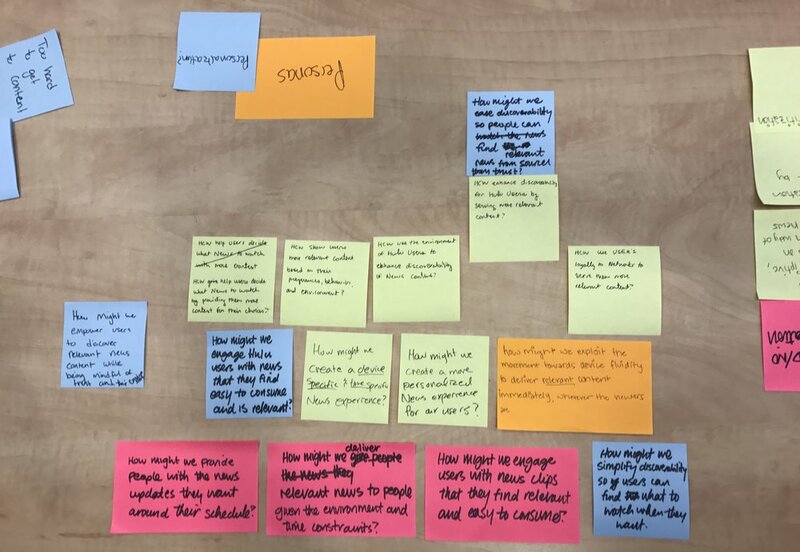 Clustering the Post-its helped us identify and understand the higher-level ideas we needed to focus on moving forward: Context, Relevancy, Trust, Discoverability, and Environment. This exercise helped us generate many new questions to consider in our designs. For example, what is it like for someone who watches the news in the morning and right before they go to bed? From talking to different people, we found that many like to leave the news playing in the morning while they're getting ready for work. What does the lean back experience look like for people who don't want to actively watch the news? With these questions in mind, we set out to design a variety of initial mockups. In our designs, we chose to put news clips in its own space rather than together with the long-form news. Having a separate space should help people get to the content they want to watch more quickly. Mixing the types of news together could confuse users. 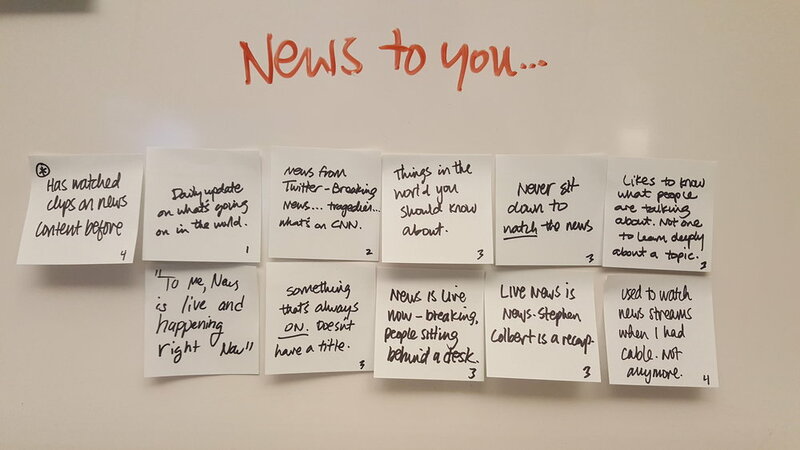 We heavily debated if the news clips should be grouped by category or by topic. The two mockups above illustrate this idea. In the first option, users would get informed about a range of issues under one broad category (ex: Politics) while in the second, they would watch a series of clips all reporting on one issue (ex: Health Care Bill). Which method of grouping would people prefer? We investigated this issue later on in our user research study. We made various iterations of the layout and design to test for user preference. We did not know how much of a description to surface in the preview of the clips. Most of the other experiences we tried showed just a headline with barely a description. Also, we noticed that they generally laid out the playlists of clips in a horizontal fashion. We attempted to place our clips vertically because the rest of the Hulu experience relies on vertical scrolling. We got feedback from other designers that this two column, vertical layout would be challenging to navigate for many people on the Living Room platform. Some of the designs we made introduced features that would allow people to get updates on developing stories. They could save interesting topics to "My Stuff". For example, if they followed the "Health Care Bill" topic, new content would automatically be saved for them to watch later. 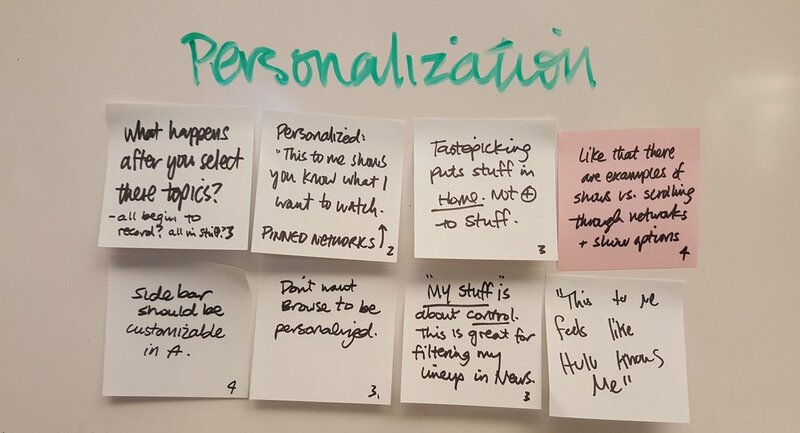 We were interested in exploring personalization features. 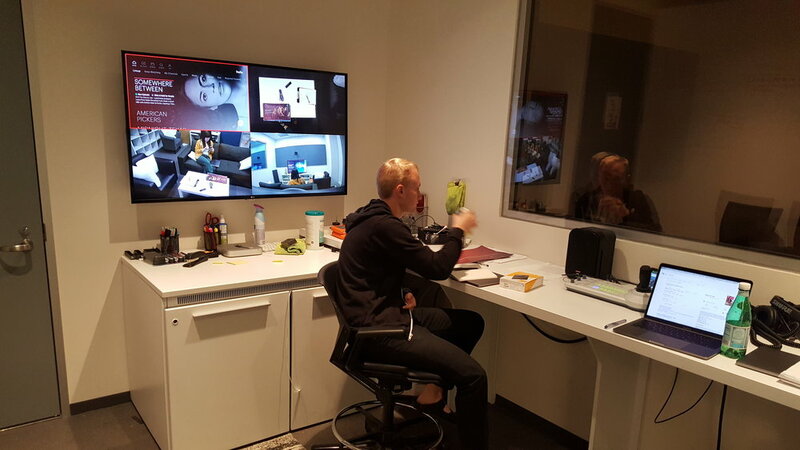 To help us move forward, we conducted user studies in the research lab for two days. We worked with Lauren, the UX Research intern, to design a test plan for the two day study we held in the research lab. In our test plan, we outlined the research goals and questions we sought to answer. We chose to make use of paper prototypes instead of digital mockups because we knew we could get more candid feedback that way from participants. We did not want them to hold off on critiquing our work because it might look like it's in a polished or finished state. Getting to observe and help with the user studies was a valuable experience. While Lauren walked the participants through the tasks, we took notes on the other side. We transcribed the interviews, detailing people's preferences for personalization, layout, navigation, and more. We discussed the preferences people shared during the research study and thought of ways to include their suggestions in the final iterations. We came out of user testing with a strong understanding for what people wanted in the designs. Many of the questions we had concerning layout, navigation, and personalization got answered through the study. 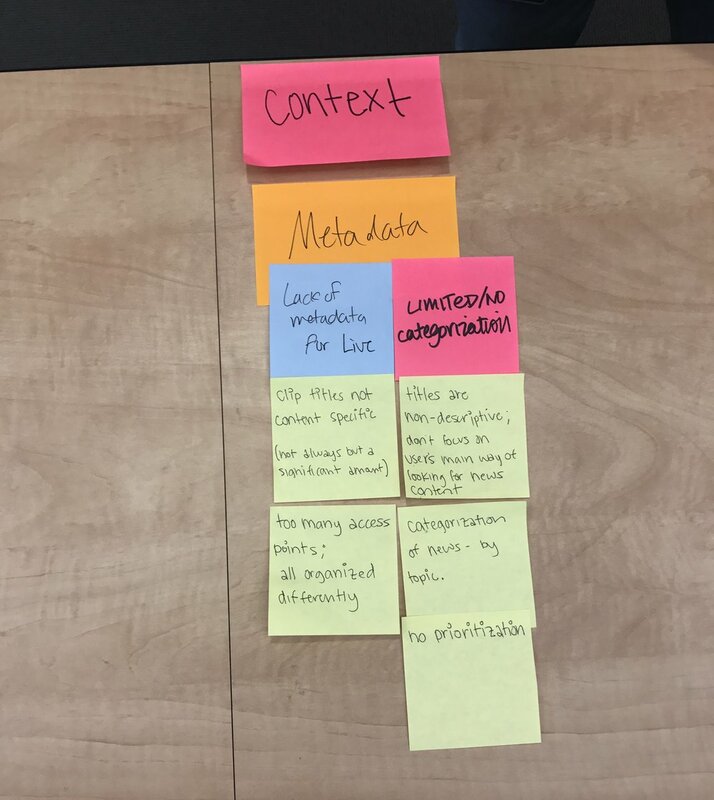 At the end of each day, Lauren sent us a research output that summarized the key-takeaways we gained from doing the study. Her notes helped us significantly in our process of designing the final explorations. People liked having the news clips separated from the long-form content as we had predicted. However, the use of the word "Topics" confused participants. They didn't expect to see news clips under the label of "Topics". People responded a lot better to seeing news content under the title of "Top Stories". 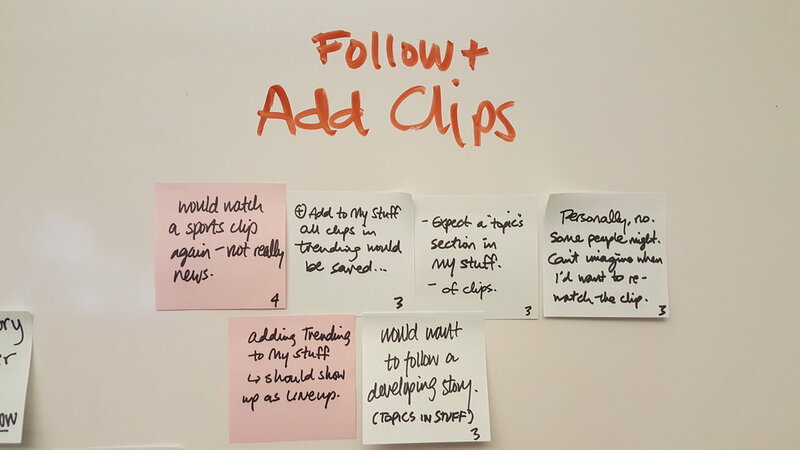 Participants strongly preferred having the news clips grouped by category instead of by topic. They wanted to have control over the content that they watched. If we presented them a very specific playlist of news clips upfront, they would feel like the system was deciding what sort of content they watched. We grouped the clips by Trending, Politics, Business, Entertainment, Sports, etc. The participants found the vertical designs to be confusing so we stuck with the horizontal layout for news clip playlists. Also, we learned that people liked seeing the headlines and did not care much for having a description in the preview. We chose to hide the source in the preview as well so that the focus remains on the content of the news itself. 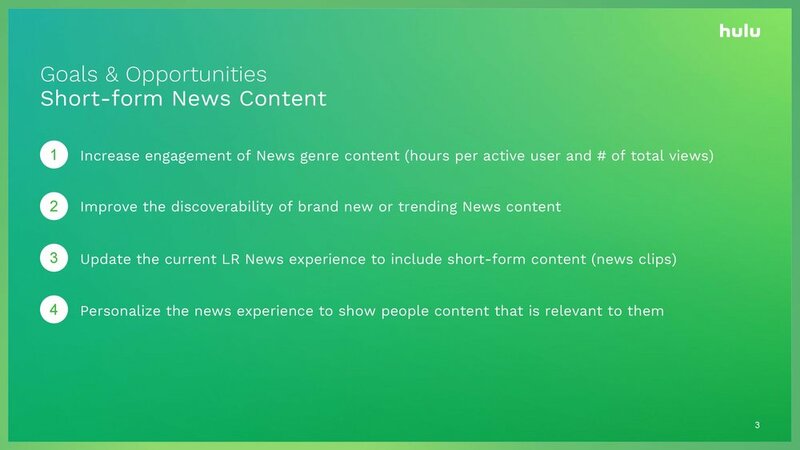 In the span of five weeks, we developed and tested a vision for serving short-form news content on Hulu. From the start, we knew this project would be largely self-directed. As a small group of interns, we held each other accountable for our assigned roles and responsibilities. We balanced working independently and collaboratively on various tasks, supporting each other along the way when it was necessary. Many of us had never worked within sprint deadlines before. It was a pleasure getting to work alongside members of the Product and Research team at Hulu. I gained design, research and management skills over the course of this project. It was a really memorable experience.